Photo by Katherine Ching, courtesy of the Geoscience Research Institute. The middle section, the abdomen, still displays a row of spines around its edge. In living crabs, the abdomen is connected to the cephalothorax by a hinge. Not only is the body preserved, but also its footprints—a series of tiny triangular impressions to the rear of the animal. 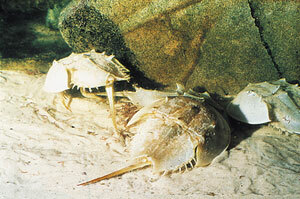 Although the crab is benthic (bottom dwelling), the track is not a record of its normal activities. It is a death trail—the last steps that the crab took. Clearly, this crab perished in exceptional conditions. Normally, when animals die, bacteria destroy the soft tissue (it rots), and the body falls apart, often within days. Decaying agents and scavengers in living environments are very efficient, removing all traces of dead animals quickly. This Horseshoe Crab must have been buried quickly to isolate the body from scavengers and prevent it disintegrating. Long-age scientists say that this limestone formed over hundreds of thousands of years in a warm lagoon, isolated from the ocean.4 They need to explain how the animals were preserved on the bottom while they were covered slowly with sediment. So they hypothesize that the salinity of the water increased greatly at the bottom of the lagoon, preventing bacterial decay and scavenging. But why would crabs want to live in such a hostile environment? They say the crab must have been washed in. But how could a crab be washed from the bottom of the ocean and into an isolated lagoon? Why would a storm, severe enough to lift a crab from the bottom of the deep ocean, not disturb the bottom of the shallow lagoon? For that matter, how would the delicate footprints be preserved from water movements produced by such a storm? 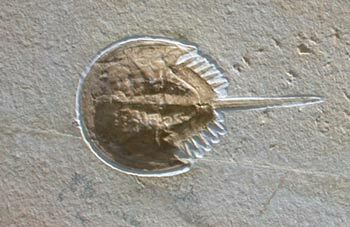 A hypothetical lagoon lasting for hundreds of thousands of years does not explain the Horseshoe Crab fossil. Rather, the fossil crab points to rapid burial in a watery catastrophe that affected the oceans, the land and the atmosphere. 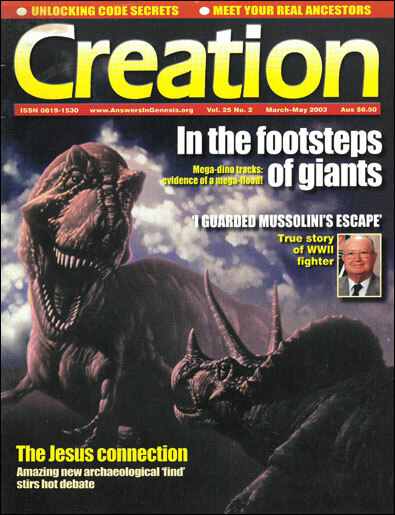 The Bible describes such a global flood in Genesis chapters 6 to 9. During this event, abnormally high sedimentation, probably combined with chemical precipitation of limestone, stopped the Horseshoe Crab dead—even preserving its delicate tracks. Ching, K., The Jurassic Solnhofen Limestone, Geoscience Reports 33:6–7, 2002. Return to text. The Horseshoe Crab: Anatomy, 3 December 2002. Return to text. Maryland Horseshoe Crabs: Anatomy, 3 December 2002. Return to text. Localities of the Jurassic: The Solnhofen Limestone of Germany, 3 December 2002. Return to text. The plate limestone from Solnhofen, 3 December 2002. Return to text.